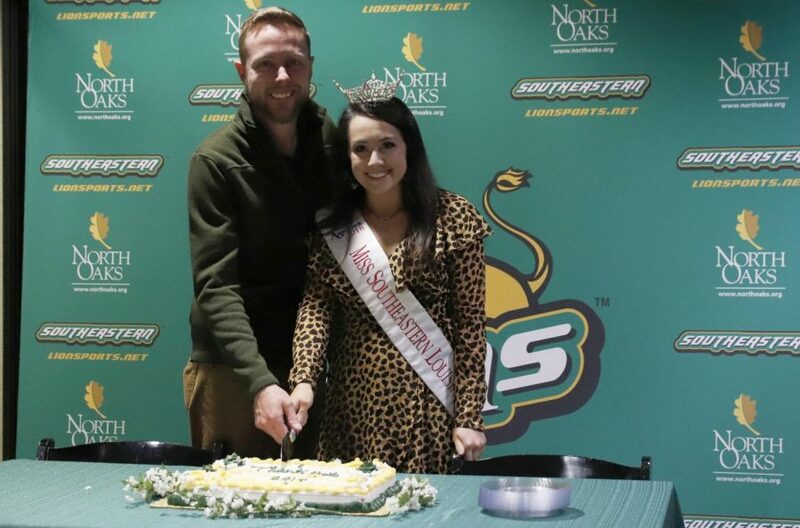 Alyssa Larose, a junior elementary education and special education major, cuts the cake with Coordinator of Campus Activities Board Nick Elliott, celebrating her time as Miss Southeastern. 2018 Miss Southeastern Alyssa Larose organized a farewell banquet as she prepares to give up the crown. Larose’s legacy as Miss Southeastern included building sponsorship for the pageant. Owner of Bra la Vie Andrea Kopfler shared why she became a sponsor. According to Kopfler, Larose is leaving a positive legacy with the pageant. Coordinator of Campus Activities Board Nick Elliott worked with Larose in her year’s journey with the crown. Alicia Schouest, a junior nursing major, saw Larose fitting into the position as a close friend.